Big Lick Galaxy Group is found in Canes Venatici. 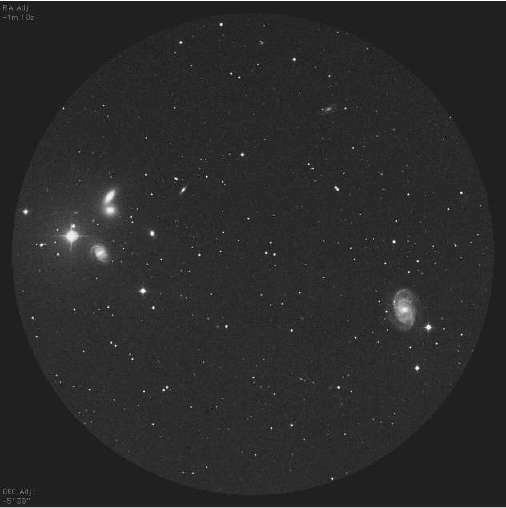 This attractive group includes ten galaxies, several of which can be seen with good transparency by average amateur telescopes in the Northern Hemisphere. This group is nearly overhead during spring, which is ideal for most viewers in Europe and North America. The DSS image here is what could be seen with a large Dobsonian at 92x showing just over 42 minutes field of view. A smaller scope won't be as bright, but could still locate most of these galaxies. This group is especially easy to find. Just imagine that the Big Dipper's handle has one more star beyond its last one, Alkaid. This extra star would continue the handle's curve, and be just a bit farther removed from Alkaid than it is from Mizar. That should get you very close to this group. Of course, you could always use go-to and/or coordinates, but a star-hopping search is more fun. The brightest galaxy is NGC 5371. 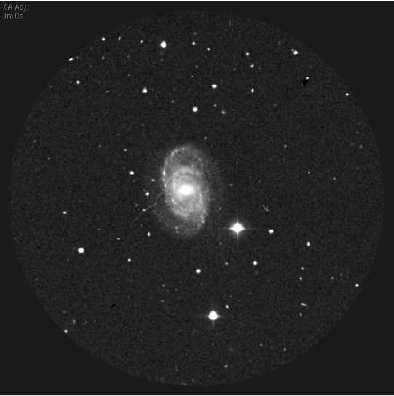 It is a fairly large spiral galaxy with low surface brightness, but not too dim. It is set apart from the others. 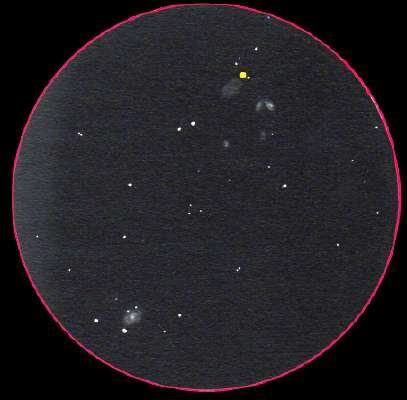 NGC 5371 is magnitude 10.8, and is at RA 13h 55.7m, and Dec 40 degrees 28.02m. Size: 4.3 x 3.4. NGC 5353 is second brightest. It is part of the tight grouping. It is magnitude 11.1, and is at RA 13h 53.5m, and Dec 40 degrees 16.98�. Size: 2.2 x 1.1. Third brightest is NGC 5350. It is part of the tight grouping. It is magnitude 11.4, and is at RA 13h 53.4m, and Dec 40 degrees 22.02m. Size: 3.1 x 2.3. 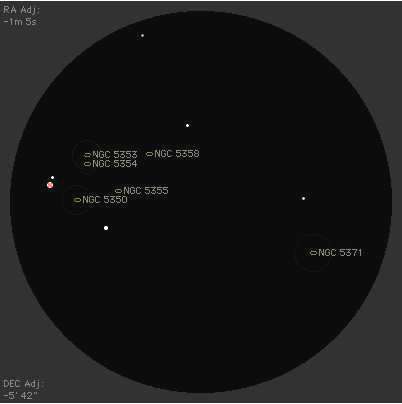 Fourth is NGC 5354 at 11.5, and it is at RA 13h 53.5m, and Dec 40 degrees 18.00m. Size: 1.4 x 1.3. 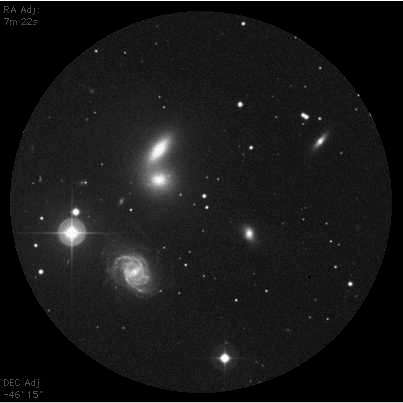 There are other galaxies visually associated with this group, such as NGC 5355 at 14 magnitude, and NGC 5358 also at 14 magnitude. Though dim, they are small, so their light is more concentrated, allowing many of us to visually see them. The bright star near 5350 is a beautiful K5 at 6.48 magnitude. How Did "Big Lick" Stick? The name for this stellar group was originally suggested by John Goss, a member of the Roanoke Valley Astronomical Society. 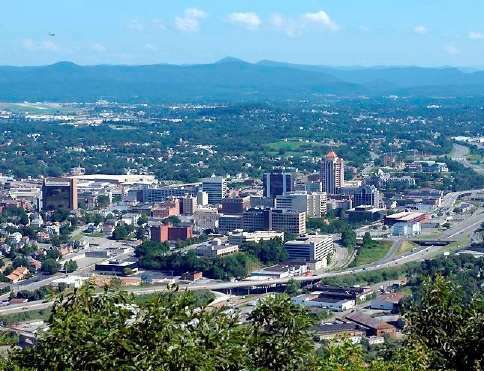 It was chosen to honor the early name for Roanoke, Virginia. 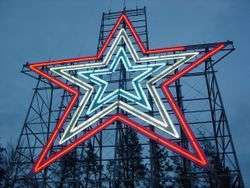 Roanoke is home to the world's largest free standing star! It is eclipsed in size only by a string of lights on a hill near El Paso, TX. Who ever heard of a star on the side of a hill? Roanoke's star soars into the night sky, and has done so since 1949 when merchants erected it in honor of the Star City of the South. The only other standing star like this is much smaller, in New Zealand. Big Lick was named for a big salt lick marsh in the valley where prehistoric megafauna gathered. These giant beasts attracted hungry prehistoric spear hunters when they found the valley. Soon thereafter, all that was left to kill was small game, and fish in the Roanoke River. When the Virginia and Tennessee Railroad (V&T) built through the Roanoke Valley in the 1850s, Big Lick was established as a stop. The name originated with a natural salt lick nearby. After the American Civil War (1861-1865), William Mahone, a civil engineer and hero of the Battle of the Crater, was the driving force in the linkage of 3 Virginia railroads, inclduing the V&T, to form the Atlantic, Mississippi & Ohio Railroad (AM&O), a new line extending from Norfolk to Bristol, Virginia in 1870. After several years of operating under receiverships, Mahone's role as a railroad builder ended in 1881 when northern financial interests took control. At the foreclosure auction, the AM&O was purchased by E.W. Clark and Co., a private banking firm in Philadelphia, which controlled the Shenandoah Valley Railroad then under construction. The AM&O was renamed Norfolk and Western Railway (N&W). Frederick J. Kimball, a civil engineer and partner in the Clark firm, headed the new line and consolidated it with the Shenandoah Valley Railroad. For the junction for the Shenandoah and the Norfolk and Western, Kimball and his board of directors selected a small Virginia village called Big Lick, on the Roanoke River. Although the grateful citizens offered to rename their town "Kimball", on his suggestion, they agreed to go with Roanoke after the river. As the N&W brought people and jobs, the Town of Roanoke quickly became an independent city in 1884. In fact, Roanoke became a city so quickly that it earned the nickname "Magic City."